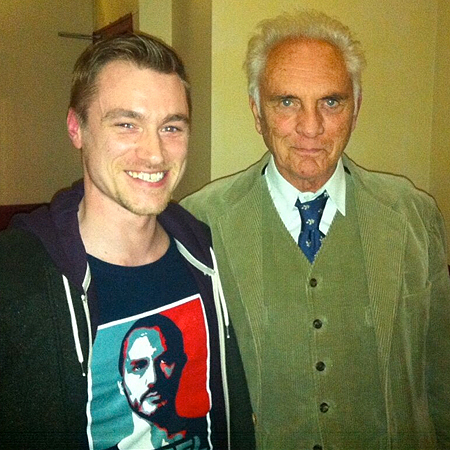 The winner of our Best Picture of the Month competition for February was Dallas King with this great picture of a recent encounter with General Zod (you might also know him as actor and living legend Terence Stamp). Dallas wins 3 Last Exit to Nowhere T-shirts of his choice from our range. If you’ve got a photo you’d like to send in to our monthly competition, then send it to us at: info@lastexittonowhere.com subject: Best Picture of the Month. We accept all ideas, photos, drawings etc. – so it’s not all about exceptional photoshop talent, or meeting famous folk. The only thing we ask is that the image references Last Exit to Nowhere in some way. Now KNEEL for Terence.